I managed to get the Terminator Sergeant finished last night. He didn't take too long to do, the color scheme was already decided a long time ago. He leads a squad of similarly armed members. 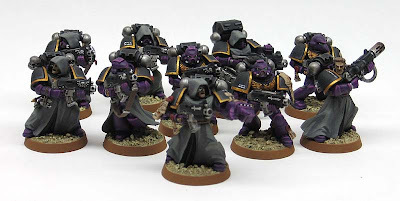 With a reversed color scheme of the regular power armored Marines, these guys should look sharp on the table. Despite the setback this weekend and the amount of work left to do to finsh the repairs on my house... I was determined to get a little bit of painting done before the end of the week. These power armored guys were already finished so here's a quick shot of a handful of them. Thats great work mate, I love the Termi. All round its a really effective colour scheme which you've carried over great as usual! I was wondering what it must be like doing commissions. I'm an incredibly slow painter, and I invest an awful lot in my models. 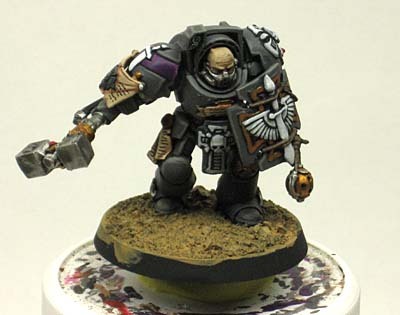 I can imagine it must be quite hard to let a really nicely painted model go when you’re done with it. Though I guess the money helps! sovietspace: Commissions are fun for me. It's a way to paint and build things I would otherwise never get to do in a million years. At first, I thought it might be tough to part with the models but they aren't mine to begin with. All I do is try and treat them like my own while I have them and paint them the way I would want them done if I were going to use them. As for the money, I charge what I would be willing to pay and I really try to keep it affordable. That way I stay in business too. If you do not mind sharing your secrets what steps and paints are you using on the purple parts. I did commission work a long time ago and I have to say that the greatest part of it was seeing peoples reaction once I 'unveiled' their models. eriochrome: Give me a few days to put something together and I'll post the process step by step. It's simple but there's two small tricks involved. I have to agree with Oni that the best part is the ohhs and awws from the client when you hand over his finished stuff. I do commission occasionally but I used to do it a lot more. Great work Ron, those purples are really impressive. Sounds good Ron, I will keep my eye out for it. Fantastic work! The purple looks awesome, I look forward to your step-by-step. Whoever these are for will be over the moon! Nice work, very clean colors that work well together. That is a great color scheme - very striking! Keep up the great work! Thanks guys, they are only painted to a tabletop standard but when you put them all together in a squad, they look even better because of the consistency across the unit. You really do a good job with getting those solid, clear colors -- something that is harder than it looks. It's a "small" detail that really distinguishes a great painter. Ron these are looking really good mate, the colour combo works nice and I love the colour reversal for the Terminators!! Thanks guys, I'm thinking about doing a really detailed tutorial on painting like this. Something that covers everything from start to finish so that anyone could use it to reproduce the same results as this without any problem. They are looking sharp, make sure you get a shot of the entire army before you send it off. The color scheme is very effective! they are excellent as table top standard, really its a display standard for me! Gavin: I will for sure, it will be the only way I get pics to show others. Once they're shipped off, there's no getting them back to show anyone. Sidestreaker: Thanks. It's really not much to them. A couple of specific techniques and you're set. The majority of the work is done in the planning stages I've found when to comes to painting. John: It's really simple, I did a tutorial for it here.